Your mouth serves many functions like smiling, chewing and speaking. Dental health is also directly related to your overall body health. Discoloured teeth, broken teeth, gum infection and other dental problems can also affect your self-confidence. With this in mind, maintaining good dental hygiene is extremely important. Below is a list of 10 useful tips to help you to keep your teeth and mouth in the best condition you can. Brushing your teeth helps to remove food debris and prevents the formation of dental plaque. Using a good quality toothpaste to brush with helps to fight against bad breath and gives the overall feeling of freshness. Some toothpastes also contain fluoride, which helps to keep out teeth strong and prevent cavities forming. The main contributing factors responsible for causing dental problems are food debris, dental plaque, and calculus. Plaque is a thin bio-film that sticks to the teeth and gums. It eventually forms tartar and leads to gum infections, dental cavities, and other oral diseases. Ideally, you would brush your teeth after each time you eat, but at the minimum you should brush your teeth twice a day. Brushing your teeth after breakfast may be a morning ritual for many of us but it is just as important to brush before bed. Your mouth remains closed for a long period of time during the night and micro-organisms can thrive in this environment if you don’t brush before going to bed. Flossing is equally important as brushing teeth and too often gets skipped in our busy lives. Floss removed the remnants that are stuck between teeth that a toothbrush can’t reach. Food lodgement in between your teeth can cause cavities, gum issues and other oral problems. Brushing alone cannot effectively clean such tricky areas. 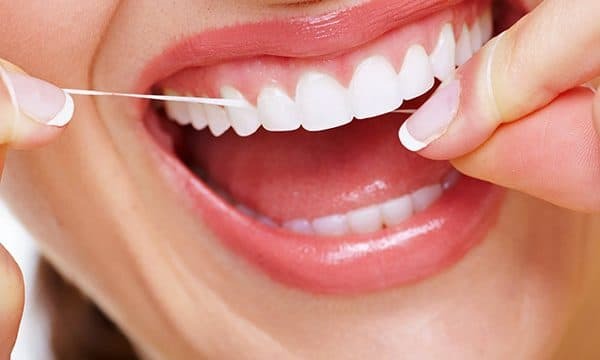 Flossing is essential to maintain great dental hygiene. Regular dental check-ups and cleans help to diagnose or identify problems at an early stage. Dental cavities initially require a filling. If they are left for too long without treatment they can become so large that they may require root canal treatment or extraction. It pays to stay up to date on your regular check-ups and dental hygiene. Negligence when it comes to your teeth can cost a lot! You should avoid smoking and other substances that are harmful to your teeth. Limit snacking between meals and reduce your intake of sugars. You should not bite your nails or open bottle caps or packets with your teeth. If you have the habit of sucking your thumb, lip-biting or clenching your teeth, you should consult your dentist for appropriate treatment. Choose foods that are beneficial for your dental health. Maintaining a good diet can help with your overall oral health. Nutritional deficiencies can result in malformed teeth and gum bleeding. Avoid sticky food and those containing high amounts of sugar. Acidic drinks such as juice and soft drinks should also be avoided as high amounts can damage tooth enamel. Baby teeth are equally as important as adult teeth. Although they eventually get replaced by permanent teeth they still serve major functions in the early stages of your child’s life. Baby teeth play a key role in guiding the adult teeth into their correct place. Regular dental check-ups during childhood serve as the building blocks of good dental hygiene during the later phases of life. Avoiding dental treatment because of fear or cost. However, preventative check-ups and treatment do not cost much when compared to extensive care like a dental crown, implant and others. Any delays in treatment advised by your dentist can impact your dental hygiene in a negative way and end up costing you much more in the long run. Trauma and accidents can cause teeth to fracture or even to be completely knocked out of the mouth. It is important to always wear a mouthguard to protect your smile while playing sports. If you are overdue for your routine dental check-up and clean, then contact our friendly team at your local Dentist in Pimpama to arrange an appointment today.